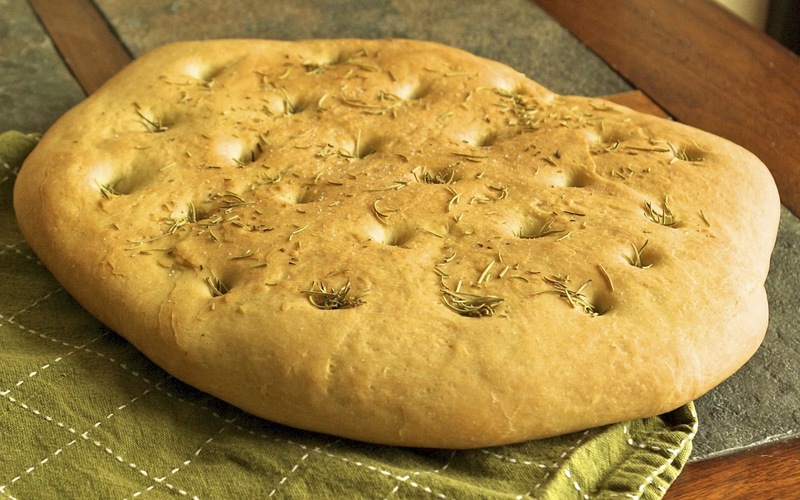 Focaccia has always been a favorite treat of mine, but until recently, I left this flavorful bread to the restaurants and bakeries. This all changed the other day when I was watching the Food Network and came across Chef Anne Burrell demonstrating how easy it is to make your own focaccia at home. Intrigued, I gave it a shot. Wow was it good. Light an airy, yet slightly chewy at the same time, this focaccia has a wonderful texture accompanying an absolutely incredible flavor; it easily rivals anything you would buy at a bakery. Pair it with your favorite soup, slice it in half for a wonderful sandwich, or simply dip it in a combination of olive oil and parmesan cheese for a delightful appetizer or tasty snack; the options are endless and each one is incredible. So stop what you’re doing, and go make this recipe. You won’t be sorry! I love rosemary and sea salt sprinkled across my focaccia, though it is also delicious with a generous dusting of Parmesan cheese. If you opt for this route, be sure to add the Parmesan with about 10 minutes left of cook time; this will prevent the cheese from burning. Also, of you use Parmesan, do not use the sea salt, as the Parmesan is already very salty. This dough can be prepared in a stand mixer, by hand, or in a bread machine, which is my preferred method. You will find instructions for the bread machine method below, as well as a link to the original recipe, which provides instructions for making it by hand. Yields: one HUGE or two medium loaves. Fresh Rosemary – optional, but highly recommended! Bread Machine – Typical instructions, be sure to check your machine’s instructions for specifics. Stand mixer instructions follow. 1 3/4 cup water, 1/2 cup olive oil, 1 tbls. sugar, 1 tbls. salt, and 5 cups of bread flour. Using your finger, make a small well in the center of the flour and put 2 1/4 tsp. of yeast in the hole. Once cycle is complete, remove bread from pan a knead a few times, using additional flour is bread is tacky. Coat a large jelly roll pan or pizza pan with 1/3 cup olive oil. Anne calls for 1/2 cup oil, so feel free to use more. I felt that it was a bit too greasy that way. This will take a few minutes as the dough likes to spring back. Put dough in a warm place, covered with a clean kitchen towel, until it doubles in size (about 1 hour). I like to put mine on top of my stove while it preheats. Liberally sprinkle focaccia with rosemary and sea salt and lightly drizzle olive oil on top. Remove the focaccia from the oven and let it cool on a wire rack. *If you would like to make this recipe by hand or in the stand mixer, check out Anne’s instructions here!